Short BTK No.62565 is a worthy member of our collection, being a unique survivor. Unfortunately however, its status as a largely stripped brake vehicle (of which we have two others for the teak train) led it to be placed at the bottom of our priority list, and unlikely to receive attention for many years to come. RVP member, Tim Pryce, therefore approached the board earlier in 2004 about adopting this vehicle for restoration as his own project at his own speed (his work patterns preventing him from joining our regular volunteer parties). 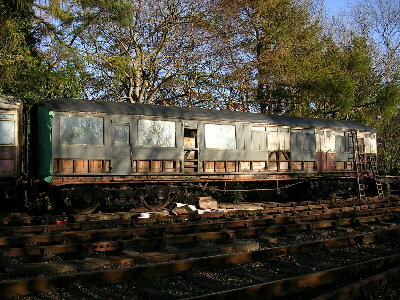 Agreement was reached to move it to the storage siding at Rothley in July 2004, and Tim has now commenced restoration work. 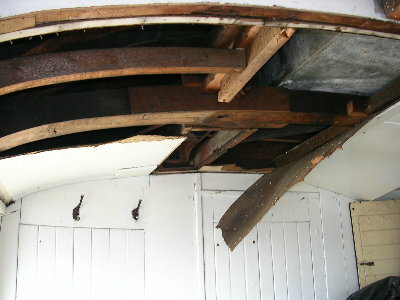 Initially this is intended to make it watertight and presentable, with full restoration then continuing with a view to it being restored to full varnished teak at some point in the future. This is Tim's own diary of his progress and will be updated as the project proceeds. 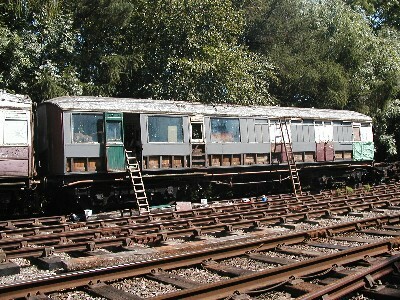 23 June 2004 - filled BTK with ply off 9124 which was stored in 23981. 8th July 04 - 62565 moved to rothley shed with long BTK. Both currently on concrete. Pictures of the east side and interior. 13th July 04 - took off all bottom panels on blood and custard side of coach. Cleaned and denailed ready for new panels. Body brackets in poor condition. Red lead oxide painted brackets at the top and repanelled leaving lower panels off. 21st July 04 - Both BTKs on far siding as agreed. Cleaned and sanded the first two window sections and painted them in grey under coat. 5th August 04 - Striped door furnishings off the first door and discovered that doors 2, 3, 4and 7 have no hinges and are nailed in place. 6th August 04 - Cleaned down paint work and painted in grey primer most of the top panels of the coach. 11th October 04 - Continued to bag the horse hair and found the coach floor! The ceiling in the toilet area is half down and the roof looks good. 26th October 04 - Finished panelling the Leicester end of the coach ready for painting. 2nd December 04 - A Pink Coach! 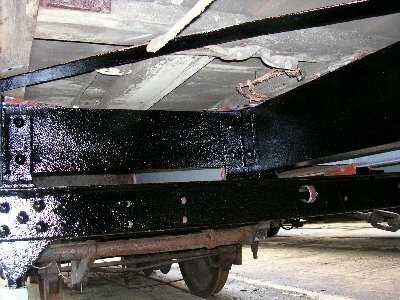 15th June 05 - Picture of work on the underframe needlegunning nearing completion. 7th Feb 2006 - Despite the long interval in reports work has continued. This has concentrated on the manufacture of the mounting brackets for the battery box - which has had to be constructed from new. 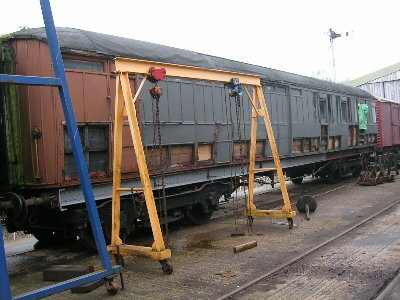 The metal work for this is now in place as the picture shows.